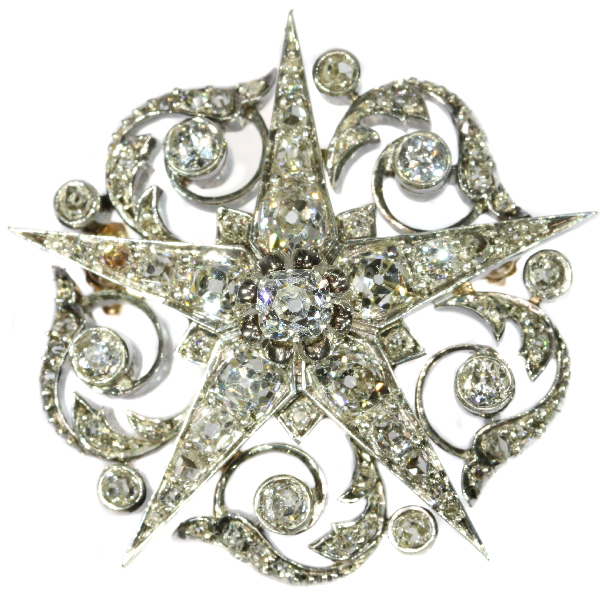 French Victorian antique star brooch filled with old mine brilliant cut diamonds: Description by Adin Antique Jewelry. As if our wish upon a star came true when the 76 silver-encrusted diamonds in this 18K red gold French Victorian brooch lit up our Garden of Adin. In each arm of this five-pointed star, five radiant diamonds increase from the tip up to the climax of a central old European cut diamond of 0.55ct. Between each of the five rays of diamond starlight, a leaflet wavers to a diamond peaking from amidst the star's prongs. Notice how very remarkable it is that this jewel is almost completely embellished with full cut diamonds in contrast with other celestial jewellery pieces, which are mostly encrusted with rose cut diamonds with only the larger diamonds as full cuts. So this 5.75ct. of diamonds will shine their light even more ardently upon your path to this illustrious brooch from 1850. Extra information: Halley's comet - It could be possible that the brooch was made to celebrate the passage of Halley’s comet. The passage of Halley inspired jewellers to make jewels in the shape of celestial bodies. This comet appears every 76 years. In 1705 Edmond Halley predicted, using Newton’s newly formulated laws of motion, that the comet seen in 1531, 1607, and 1682 would return in 1758 (which was, alas, after his death). The comet did indeed return as predicted and was later named in his honor. Diamond(s): One old European cut diamond with an estimated weight of ± 0.55ct. (colour and clarity: G/H, vs/si). 70 old brilliant cut diamonds with an estimated weight of ± 5.25ct. (colour and clarity: F/H, vs/si). Five rose cut diamonds. We do not have the weight of the diamonds which is normal in our trade when it comes to rose cuts. Total diamond count: 76 pcs. Total diamond weight: approx. 5.75 crt. (without rose cut diamond) with an average colour and clarity: F/H, vs/si. Hallmarks: The French control marks representing an eagle's head next to a wild boars head that was in use in France from about 1838. This hallmark was used for jewels that were made both in gold and in silver.